the reason she tries to hide. a broken heart that could not mend. she’s trapped in her Hell. the bird that couldn’t fly. a body without a mind. find the person she tries to be. you’d realize she is me. ADD/ADHD or Attention-deficit/hyperactivity disorder affects thirty to fifty percent of adults who had ADHD in childhood. Accurate diagnosis of ADHD in adults is challenging and requires attention to early development, and symptoms of inattention, distractibility, impulsivity and emotional changes. 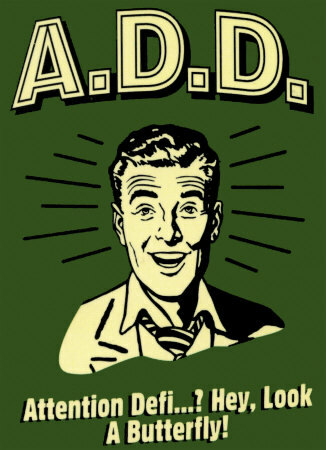 The most prevalent symptoms of ADD / ADHD are inattention and distractibility and/or hyperactive and impulsive behaviors. Difficulties with concentration, mental focus, and inhibition of impulses and behaviors are chronic and pervasive and impair an individual’s daily functioning across various settings — home, school or work, in relationships, etc. Individuals who are inattentive have difficulty staying focused and attending to mundane tasks. They are easily distracted by irrelevant sights and sounds, shift from one activity to another, and seem to get bored easily. They may appear forgetful and even spacey or confused as if “in a fog.” Organizing and completing tasks is often extremely difficult, as is sorting out what information is relevant versus irrelevant. An individual with inattentive symptoms may have great difficulty keeping up with items, frequently losing things and living life in a disorganized way. Time management is also often an issue. Inattentive behaviors are sometimes overlooked because they are often harder to identify and less disruptive than hyperactive and impulsive symptoms. An individual with the predominately inattentive type of ADHD may even appear sluggish, lethargic and slow to respond and process information. Individuals who are hyperactive have excessively high levels of activity, which may present as physical and/or verbal overactivity. They may appear to be in constant motion, perpetually “on the go” as if driven by a motor. They have difficulty keeping their body still — moving about excessively, squirming or fidgeting. Individuals who are hyperactive often feel restless, may talk excessively, interrupt others, and monopolize conversations not letting others get in a word. It is not unusual for an individual with hyperactive symptoms to engage in a running commentary on the activities going on around them. Their behaviors tend to be loud and disruptive. This difficulty regulating their own activity level often creates great problems in social, school and work situations. Individuals who are impulsive have trouble inhibiting their behaviors and responses. They often act and speak before thinking, reacting in a rapid way without considering consequences. They may interrupt others, blurt out responses, and rush through assignments without carefully reading or listening to instructions. Waiting turns and being patient is extremely difficult for someone who is impulsive. They prefer speed over accuracy and so often complete tasks quickly, but in a careless manner. They go full swing into situations and may even place themselves in potentially risky situations without thought. Their lack of impulse control can not only be dangerous, but can also create stress in school/work and in relationships with others. Delayed gratification or waiting for larger rewards is very hard for an impulsive person. ADHD, Combined Type – Individual displays both inattentive and hyperactive/impulsive symptoms. ADHD, Predominantly Inattentive Type – Symptoms are primarily related to inattention. Individual does not display significant hyperactive/impulsive behaviors. ADHD, Predominantly Hyperactive-Impulsive Type – Symptoms are primarily related to hyperactivity and impulsivity. Individual does not display significant attention problems. As many as one third of children with ADHD have one or more coexisting conditions. The most common of these are behavioral problems, anxiety, depression, learning and language disabilities. Adults with ADHD show an even higher incidence of additional or accompanying disorders. These adults may also suffer from depression, mood disorders, substance addictions, anxiety, phobias or behavioral problems. Treatment options from About.com Health’s Disease and Condition content is reviewed by the Medical Review Board.